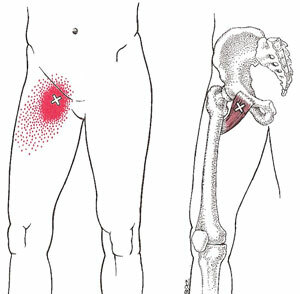 Injuries that cause pain in the groin in athletes are often misdiagnosed. They can be more difficult to diagnose and treat than other conditions such as hip arthritis or fractures. Groin pain is common in athletes involved in soccer, australian rules football, running and in those partaking in vigorous training regimens such as triathletes. There are multiple causes, which need to be excluded when evaluating groin pain in an athlete. Groin pain accounts for 8% of all injuries in soccer players alone. 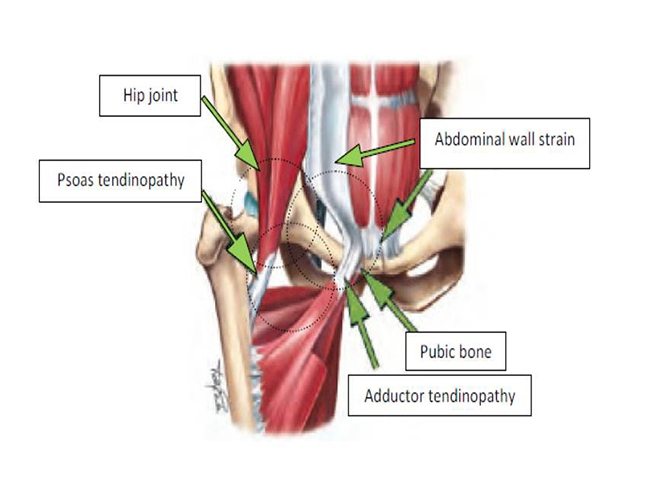 The most common musculoskeletal causes of groin pain are adductor muscle strains and osteitis pubis. Other causes can be due to nerve entrapment syndromes, or tearing of the ace tabular labrum or stress fractures. Femoroacetabular Impingement can also cause groin pain, and is due to the mismatch in the head and socket in the hip joint. Hernias of bowel may also cause groin pain. Pain may also originate from other areas in the body, such as the lumbar spine, abdominal muscles or the knee. It may also be due to genitourinary problems. Currently, the condition requires a specialised approach to determine the cause. In some cases, the cause will remain elusive. Often your surgeon will perform an MRI which is used to highlight soft tissue injuries around the hip joint. This is a good modality as it does not use ionising radiation such as a CT scan or Xray, therefore it is very safe. An ultrasound can also be used, when considering dynamic causes of pain, such as impingement of tendons on bone, or bone on bone. Bone scans can also be used to look for increased uptake, especially in the pubic symphasis area or adductor attachments. A Gilmore Groin was first described in 1980 after the successful treatment of 3 pro soccer players. It is caused by a torn external oblique muscle attachment, a torn conjoint tendon (Where the inguinal ligament attaches) and a lack of clinically detectable hernia. It is most common in soccer players and usually starts insidiously (i.e. without a single obvious traumatic event). Initial treatment is non surgical, but is usually unsuccessful. Treatment surgically is to restore normal anatomy with a complex suture repair. There is an estimated 97% success rate with this procedure, but it is rarely performed. There are many other causes of groin pain in a sports person. Seeing a sports physician, followed by an orthopaedic surgeon is a good start. Dr Chien-Wen Liew has an interest in sports injuries, especially of the hip, knee and shoulder. He utilises minimally invasive techniques in almost all cases to identify and treat sporting conditions to enable a faster rehabilitation.